A federal group is selling collector’s coins of Border Patrol Agent Brian A. Terry, who was killed in a shootout while on duty, to raise money for a foundation created to honor Terry. 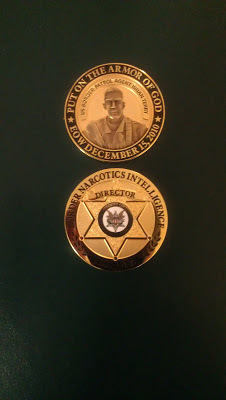 Called the “Challenge Coin,” the Border Narcotics Intelligence is selling the coins online for $15. Terry’s death grabbed national headlines because it revealed the federal government’s botched “Fast and Furious” drug smuggling investigation. Posted: 6/14/13 at 8:43 AM under FBI, News Story.